Check your latest cable TV bill. 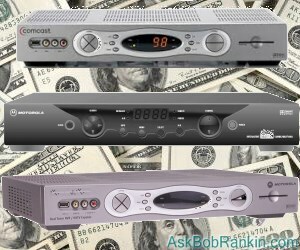 How much do you pay every month to rent your set-top box(es) from the cable company? Most households pay about $20/month, in addition to all the other charges on that bill. Have you ever wondered why you can't just buy a set-top box, instead of paying that fee, month after month, year after year? Consumers already have the freedom to attach any FCC-compliant phone, cable modem, or other device to the telecommunications networks they use. Why not allow the same choice for the box that decodes cable programming, changes channels, fetches on-demand programming, and provides other interaction with the cable service? The answer is, “money,” of course. Set-top boxes are just small computers, so they could easily be programmed to provide other services for which cable companies could charge. Home security and automation systems are examples. The set-top box could serve as the household hub for the Internet of Things. My research indicates these boxes would sell for under $100 if available in a competitive marketplace. Naturally, the cable companies will fight tooth and nail to maintain control of those boxes. FCC Chairman Tom Wheeler said that the Commission is responding to consumers’ concerns about choice and what they get for their monthly rental fees. Wheeler cited a FCC study that found “over the past 20 years, the cost of cable television set-top boxes has risen 185 percent, while the cost of computers, televisions, and mobile phones has dropped 90 percent." If you're tired of shelling out a fat wad of cash every month for 500 channels you never watch, and a set-top box that ends up costing 5 or 10 times what it should, you can join the ranks of "cord cutters" who are cancelling their cable TV. They're using inexpensive streaming media devices to bring their favorite TV shows and movies direct from the Internet to their TV screens. See my article Streaming Media Gadgets: Is it Time to Cut the Cord? Cable companies are flinging bushels of mud at the proposed rule, little of which sticks. "The proposal, like prior federal government technology mandates, would impose costs on consumers, adversely impact the creation of high-quality content, and chill innovation," wrote Comcast. If the new rule takes effect, it “will ignore contractual freedoms, weaken content diversity and security, undermine important consumer protections like privacy, and stall the creative and technical innovation that is driving positive changes in today’s TV marketplace," added the National Cable & Telecommunications Association (NCTA), the biggest cable lobby group. Opening up the set-top to competition would somehow deprive content producers of their copyright protection, added the NCTA. In fact, the proposed rule would still require customers to pay for what they view. It imposes no new costs; indeed, it would make it possible, but not mandatory, to do away with hardware and view the cable content for which you pay on any digital device via an app. That’s a bit more compatible with today’s mobile lifestyles than being tied to the TV set in the living room. The FCC has issued a Notice of Proposed Rulemaking. The next step is up to consumers, who are encouraged to submit their comments on the proposal via the FCC’s web page for Proceeding 16-42. Note: you must prepare your comment in a word processor or text editor file, then upload it via the “Submit A Filing” link on the page. I was surprised to see that as of today, there are only a handful of comments. The FCC needs to hear, loud and clear, from consumers all across America, that the monopoly on cable set-top boxes should end. Tell them you agree with their 'Unlock the Box" proposal, and you want the freedom to purchase your own equipment, instead of paying exorbitant monthly lease fees. It may take up to a year to finalize this important rule. But once it’s in place, we can expect lower monthly bills, more choices, and more innovations in cable program viewing. Most recent comments on "[MONOPOLY] Cable Set-Top Boxes"
As L Fisher asked, could you please explain the impenetrable FCC form? Specifically: proceeding number; exparte? ; file number; report number; Bureau ID. Also, to make a short comment rather than attaching a document, does clicking CONTINUE bring one to an online form for text entry? You have evidently done this before. I also think it's ridiculous to have to use their set top boxes when my tv has a perfectly good tuner built in. Why can't we go back to the time when I attached the cable to my tv and used my tuner to choose what I watch. Another ridiculous thing is the need to have one of their boxes for each set I want to use. If I have 4 sets I have to have 4 cable boxes. I either want 1 box for the entire house or no boxes and each tv tunes it's own channels. This is why I'm strongly considering cutting the cord. I have posted my comment. I have posted a link to your article on my FB page. Vive la revolucion. Hmmmm. y muerte a la comcasta. Thank you so much I have submitted a response appreciate the heads up!! The steps you have to go through to post comment on the FCC's website is very complicated for most of us and I believe that's why people are not responding.A petition or another way needs to be started. Cut the cord three years ago. Have Tivo for OTA, records what I watch on CBS or NBC, watch at my time schedule. Tivo recently added a commerical skip, love it. During the bowl season added Sliing TV, didn't like it, just cancelled it. Have Netflix and Amazon Prime. Will not live long enough to see all they offer. Never going back to DirecTv. Also don't lose programing during a storm. But, the cable company is still sticking it to me for internet. Which reminds me, I need to call Cox, they just raised my account $10 again. What's to keep the cable companies from simply raising their rates on other services, to make up for the revenue lost on renting set-top boxes? Thank you for alerting us to this FCC proposal. I agree with you and many others, it's past time to put an end to this monopoly on set-top boxes. Bob, your one statement said it all - "DirectTV allows customers to use third-party equipment, but charges a “network connection fee” that effectively eliminates any savings." What this simply means is that if other cable and satellite companies can't rent you a box, they'll just charge a 'network connection fee' to access programming and you'll still be paying out your you know what. They're going to squeeze every penny possible from you. I don't mean to sound so gloom and doom, but I'm a realist. Never had a cable to cut! I've used an antenna since the 60s to receive about 50+ channels here in southeastern Wisconsin. I have two Magnavox hd dvrs, (from Walmart) a Phillips hd dvr (from Radio Shack) and a Homeworx dvr which uses an external hard drive. I won't live long enough to watch all the hours of programming on these units! lol i use an Ooma for free phone service and I get broadband internet from a local provider since 2000. I hate monthly fees for anything and I refuse to allow any tv provider to pump tons of commercials and bad programming into my house and expect ME to pay them for it?! I've saved many,many thousands of $ over the years. It's your money folks! I would like to occasionally do some time shifted viewing but my STB does not have DVR capability. Directv would be happy to fix that for another ten dollars a month. Ain't gonna' happen. I would definitely be in line to buy a third party box. Just purchased an xfinity Arris Docsis 3.0 Telephony modem on ebay (New) for $135. Setup with Comcast with no problem. Save $10 a month. Should have done it years ago. I agree the website could be more user friendly, but maybe this will help some of those folks having problems. First, type out your comment on your own text editor. Notepad is what I used, but you could use a word processor if you want. Save it in a place you'll remember for 5 minutes. Next, click "Submit a Filing in 16-42" which is near top left of page, directly over "Proceeding 16-42 Details"
In "Details" section, you can leave everything blank, except for the "type of filing" box, which should already say "Comment"
Click "continue", and the rest is obvious. A satellite dish, LNB, mounts and cable connected to satellite decoder(s) is a cheap and effective option. A plethora of free to view channels are available. Decoders are available for about $30-$40 each. A splitter will allow multiple decoders to be attached to a single dish so you can have a decoder at each TV. A multiple LNB setup on the dish, or multiple dishes will allow you to access more satellites and thus more content. No more monthly subscription and the whole setup cost will be recouped in about a year, depending on how flash a system you go for. one word KODI free download install to a computer and stream all the content you could want. Then cut the cord. If more people did this the cost of TV would have to come down. I solved this problem another way. I don't watch TV. IMO it's a waste of time. And, it's a brain washing tool. As past FCC chairman Newton Minnow once said: 'Television is a vast wasteland.'. Response to Chuck: you've done exactly what I plan to do in October when my DirecTV contract expires. Six months ago, I saw the Tivo Roamio OTA on their web site for $49.95. I don't see it now, but just bought one from Best Buy for the same price. I'm guessing they weren't making money with that unit and have discontinued it. Even with Tivo's $15/month subscription, I'll be saving over $85/month on TV. Haven't ever had my dish reception drop out, and I live in SE Michigan. Your article makes it sound as if the consumer doesn't have a choice to buy his/her own box. I am sure you know that's not correct. The consumer can buy their own box (DVR or not) and lease a cable card to use that box. That would cut costs in half in most cases, on DVRs anyway. Additionally, (extra info here) I got the X1 box from Comcast (with no DVR). It has a total of 4 tuners- 1 of which i use to send signals to an Asus mini computer box, which then feeds the signal to the TV via HDMI. Signals from the other tuners might go to iPads or computers in the kids rooms. Basically, being able to do these things changes the game somewhat- making cable a bit more cost-effective for the household. The real problem seems to be that people don't know they can do these things. Further, you really have to wonder whether there will be any real savings as the Cable companies are likely to jack-up rates to make up for loss of box revenues. Just wondering out loud here. Thanks and I enjoy your articles. Dropped cable/satellite 2+ years ago. Now have over the air from 2 antennas in attic run thru a combiner (reverse splitter) and an amplifier. Purchased a Channel Master DVR+ with 2 tuners so I can DVR up to 2 channels at the same time, just have to watch a 3rd channel on the TV's built in tuner, or I could get a second DVR and record 4 channels! Channel Master just added an app for Sling TV, which I already had on my ROKU 3. Also have a Netflix acct. Believe me I find enough to watch. Cable touts 200+HD channels! Really how many of those channels would you watch? Worst case you should earn enough to pay the rental on your comcast box.